TEA/TDLR Approved Defensive Driving - Comedy Style! Defensive Driving From the Comfort of Your Own Home! Tickets happen, it's a simple fact of driving life and it is nice that Texas allows drivers to dismiss a ticket with defensive driving. It could be that you have had a ticket "happen" to you in the past, and you may remember burning up a Saturday in a crowded classroom somewhere getting that defensive driving chore done, and now you're dreading the idea of doing it all over again. Good news, defensive driving is a chore no more! 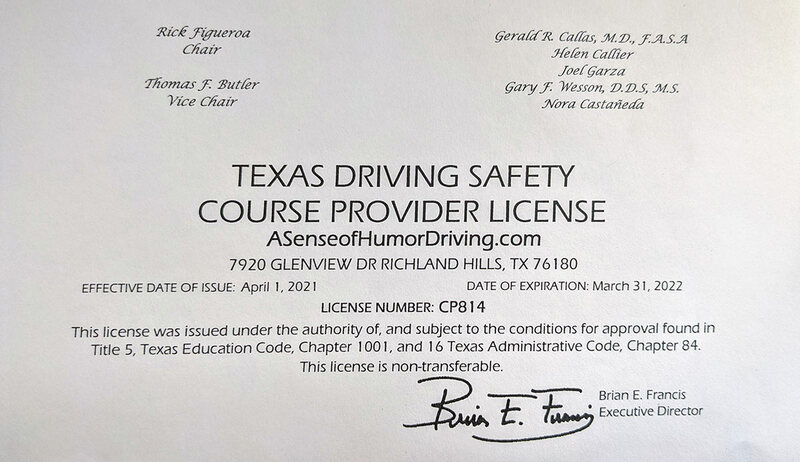 An online defensive driving course from ASenseofHumorDriving.com lets you eliminate your traffic ticket, on your own schedule, and all without ever having to set foot in a room full of strangers or listening to a boring instructor. - Our course price also includes FREE audio. Don't squint at your computer, leave the reading to us! ASenseOfHumorDriving.com gives you the ability to study when, where, and how you wish. Your convenience and customer satisfaction always come first. Yee-Haw #1 - Texas State Law allows drivers to complete a defensive driving course once every twelve months to dismiss a traffic ticket. For a course to be accepted for ticket dismissal, it must be approved by the TEA (Texas Education Agency) and the TDLR (Texas Department of Licensing and Registration). More good news!  Our State of Texas defensive driving course has been approved by both and will get you out of a ticket anywhere in the Lone Star State. Yee-Haw #2 - After you complete your course, we will be sending you two copies of your completion certificate. One is for the court, of course, and the other is for your insurance agent. Why? Because most insurance providers extend "safe driver" discounts for customers who have completed a driver safety course. In fact, we have many students who take our defensive driving course for the insurance discount benefit alone. Depending on your policy and carrier. you could receive up to a 10 percent discount on your auto insurance premiums simply by taking a defensive driving course like ours. Yee-Haw #3 - Studies have shown that drivers are involved in fewer accidents and suffer fewer injuries in the 12 months following the taking of a defensive driving course. We're willing to bet that you think keeping you, your passengers and your car safe beats beating a ticket anytime. If this is your first (or fourteenth) experience taking defensive driving, you might have a question or two along the way. Never fear, we'd never leave you hanging! Click the "Support" tab at the top of the page to give us a call or write us an email and we'll have you back on your way at a speed approaching the one that got you your ticket in the first place. Oh and by the way...If this is your fourteenth stab at taking defensive driving, may we courteously suggest that you maybe call a cab? Texas approved for ticket dismissal in every court in the state.